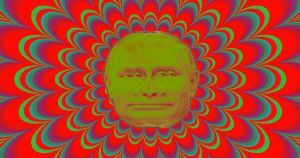 The Russian Navy has outfitted two warships with a weapon that it says makes enemies hallucinate and become disoriented. That’s according to a fearsome description of the weapon in RIA Novosti, a state-run media outlet in Russia — and it could be a terrifying peek at the future of warfare. Russia-owned Ruselectronics developed the weapon, called the Filin. It works, according to the company, by firing off “low-frequency oscillations” of powerful light that disorient foes and disrupt night vision devices and rangefinders. Volunteers who fired at targets while being blasted by the Russian weapon said they felt dizzy and nauseous, and 20 percent reported “hallucinogenic” effects. One complained that a “spot of light floats before my eyes,” according to RIA Novosti. The Hill even reported that the Filin could make adversaries vomit, but it’s not clear where it sourced that information. This new Russian weapon may have limitations, and state-run media isn’t always a reliable source of information about military technology. And on RIA Novosti, one commenter made light of the announcement by pointing out that light-based weapons might be easy to counteract. “It seems to me alone that sunglasses wipe out the power of this new super-weapon?” the commenter wrote.